Carlsbad Caverns. 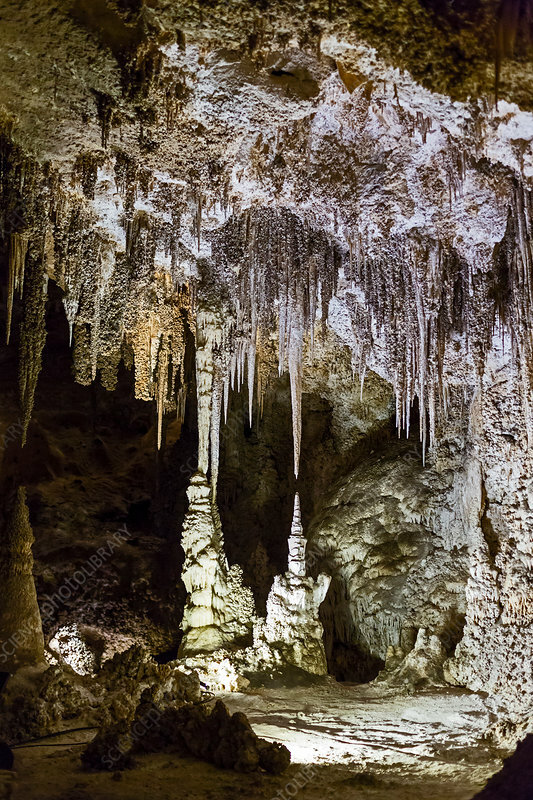 Stalactites and other limestone formations of the Chinese Theater in the Big Room of the Carlsbad Caverns, New Mexico, USA. Carslbad Caverns is one of three caves in the Carlsbad Caverns National Park that are open to the public. The caves were formed when naturally occurring sulphuric acid dissolved the limestone bedrock leaving behind over 119 caverns of various sizes. The Big Room is a natural limestone chamber almost 1,220 metres long, 191m wide, and 78m high at the highest point. It is the fifth largest chamber in North America.